Earlier we studied about how to get current geographic location using an android application. That Android app will return latitude and longitude pair to represent current location. Instead of simply showing these location as coordinates in an android application, it would be cool if we tile these coordinates on top of a map fragment. In this Android tutorial, lets see about how to show a map in Android. Following are the steps that needs to be done. 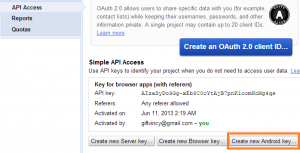 Download and configure Google Map API. 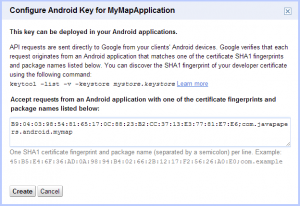 Get certificate fingerprint of android application. Create API project for the Android application. We can download and install Google Map API using Android SDK manager. This API is provided with Google Play Services packages. So we need to run SDK manager to select this package that can be found under SDK package Extras as shown in the following figure. After installing, we should restart eclipse and should import this Google play services project into our Eclipse work space as a library to add reference to the dependency JAR files with our Android map application. 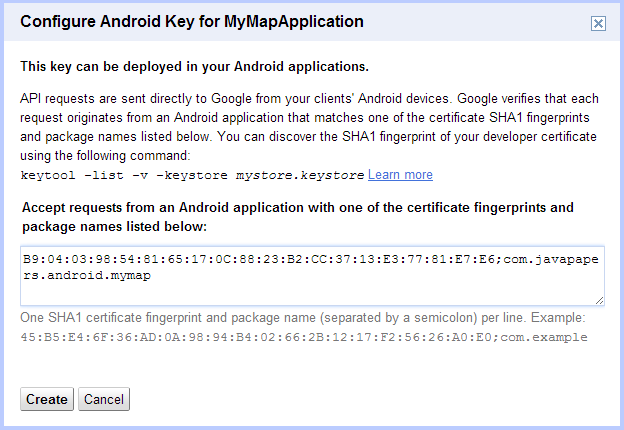 Certificate finger print is needed to get new Android API key for our application. Application’s certificates are created in two mode.(i.e.) debug mode and release mode. To create a debug mode certificate, we need not sign it using a private key. 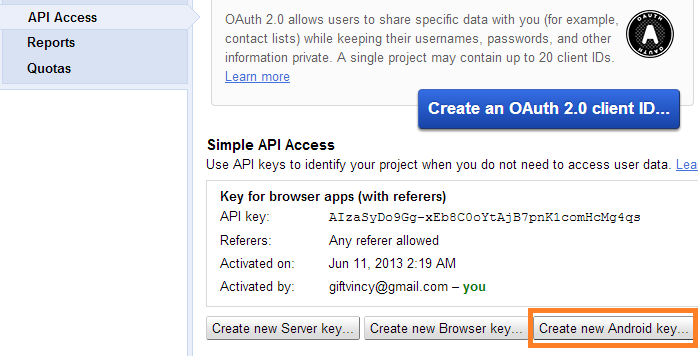 It can be signed by the build tools with a special key created by the Android SDK build tools. The release certificate will be created when we export our application for release and should be signed by a private key. To get certificate finger print in debug mode, we can use the existing keystore debug.keystore file. The location is varies based on the operating system. For example, in Windows, this file will be located where .android is located. After locating the keystore, then it’s time to enter the following line into the command prompt by replacing the keystore path. We are using the keytool utility provided with the JDK. Then, the certificate information will be shown in the command prompt as follows. And the required fingerprint is highlighted here. Let us enter the following line in command prompt by replacing keystore-name and alias-name as per our application. Create API project for our map Android application. After getting the application’s certificate finger print by signing our application using, any one of the available modes as we discussed in previous step, this finger print will be used to create new Android API key. For that a console page provided by Google is used. Let us visit the Google API Console page to create new API project for our android application. If we are creating our first API project, then we should click Create Project from left panel and should accept terms and conditions for this first time only. Otherwise, all created projects are listed with the drop down box which also contains Create link to add subsequent new API project. After that, the next step is to enable the required services that will be listed on selecting services option from left panel. Now, it’s time to create android API key. And then, the console will respond with set of keys generated. From them, we can copy API key with 40 characters next to Key for Android apps (with certificates) caption. And Finally, we can start coding with our application that is for showing map into our Android device. For that, some set of permissions are provided with Android manifest file. First, API key that is given with the Google console response is added within <application>…</application> tags of manifest file as shown below. This example project will be run using Android devices lower than 10 also. For that, we are using SupportMapFragment class instead of MapFragment to show map into the layout. So the layout file contains the following lines. And then, we are using GoogleMap for creating map instance. For this instance, a reference is added to denote the obtained map fragment using getSupportFragmentManager(). For that, we are importing GoogleMap and SupportMapFragment classes provided as part of com.google.android.gms.maps package. The following code is for this Android Activity to obtain map. 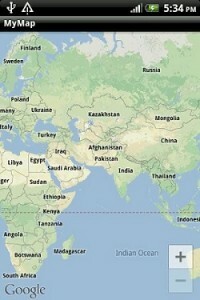 Comments on "Show Map in Android"
Nice article and it will be very useful for Android Developer. I followed all the steps as you mentioned, applicaton opens on my phone but with the blank map, i am not sure what is the issue. my phone android version is 4.0.4. Good Tutorial. Thanks a lot ;) This is the first tutorial, which explains directly how to get the SHA1 key and what you have to change in the manifest. Thanks a lot….your tutorials are simple and clear..It has been a life saver for me many times.. In this what should be the keystore_name name? hey joe..i finished the API key work..but still i m getting the same error in logcat as i posted before..
.i added library project properly..latest logcat error. Thank you for this article and given your time to make a good demo for Android Map. Comments are closed for "Show Map in Android".